It’s not often that you see a preview for a four-year-old game, but in the years following Shovel Knight’s original release, Yacht Club has kept busy introducing add-ons to the popular retro platformer, each as good as - if not better than - the last. We already deemed the game a must-have, and if the time we spent playing the upcoming King of Cards and Showdown expansions is any indication, that package is about to get a lot more attractive. King of Cards and Showdown represent the final chapters in the Shovel Knight saga. The first is a standalone campaign, similar to those released for Spectre Knight and Plague Knight. Showdown is a multiplayer free-for-all - think 8-bit Smash Bros. and you’ll be on the right track. 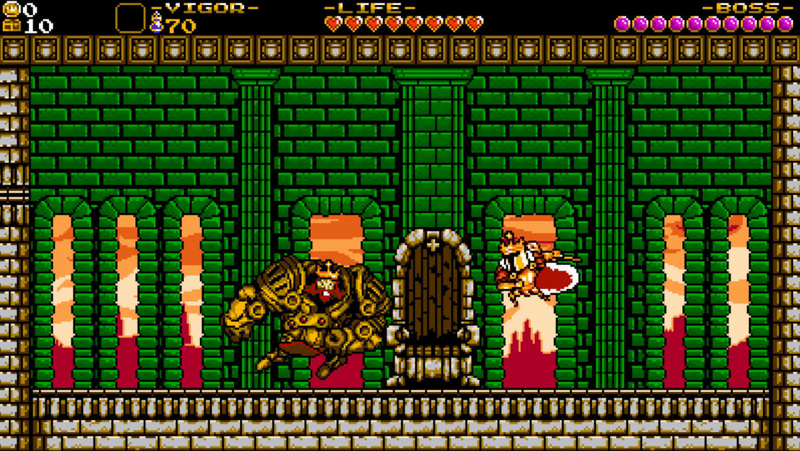 Best of all, if you already own Shovel Knight, both of these modes are completely free. King of Cards sees you in the role of King Knight, the familiar villain from the original Shovel Knight on his quest to become a true king. King Knight’s main attack is his shoulder bash, but it behaves much differently when you control him than it did when you were his adversary. Using the shoulder bash sends him hurtling forward very quickly, and upon contact with just about anything, he’ll do a spinning jump which will propel him into the air on a straight vertical trajectory. If you land on something, you’ll deal damage to it, bounce in the air again, and be able to reuse your shoulder bash to continue the cycle and reach even greater heights. This shoulder bash, bounce, repeat cycle is the core of Cards’ gameplay, and it feels immensely satisfying. In the section of the game we played, all of the challenges faced centred around this mechanic. 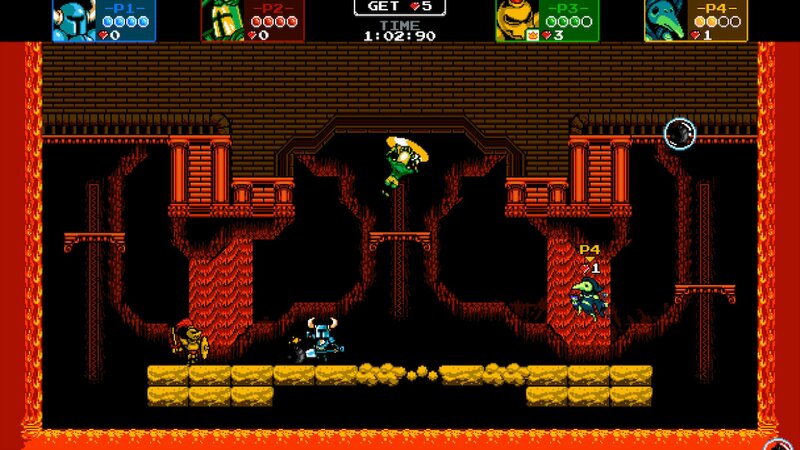 The four years’ worth of experience Yacht Club has built up changing up the Shovel Knight formula really shines in Cards, showing that you can do a whole lot with one simple move. In one section, we had King Knight bouncing between lanterns outside of a pub to reach a secret area full of treasure and a secret card, while another had us riding a dragon over a pool of lava and using the shoulder bash to keep ourselves out of harm’s way as the dragon took frequent dips into the blazing depths. Speaking of cards, the other half of King of Cards’ gameplay is, well, a card game. Throughout the world, there are several spots you can get to play Joustus against a series of opponents, including some of the franchise’s most well-recognised faces. In the demo, we found a pub with a setup similar to a Pokémon gym. In it, you had to defeat four players to face the leader of the pub, Black Knight. The rules of Joustus are simple: lay cards on a three-by-three grid and capture the gems set on the board by making sure your cards are on top of them at the end of the match. Each card has a picture of a monster and a number of arrows on it. The arrows indicate which directions it can both push and resist being pushed from. For instance, if you lay down a card with an 'up' arrow on it, and your opponent lays a card with a down arrow on it above you, your card won’t budge. Conversely, if you lay down a card with a 'left' arrow on it to the right of a card with no right arrow on it to push back, you’ll bump that card over a space, or off the board entirely if it’s on the edge - providing you haven’t already pushed a card over the edge in that direction. You can’t lay a card directly on a gem and instead have to push them to reach their goal. While it seems simple at first, the strategy involved lends it a surprising amount of depth; we just wish we could play Joustus online, which does not seem to be in the cards (no pun intended). You can fully customise your deck and there are cards of varying rarity scattered about the world for you to collect; they can be found hidden in chests or given to you as rewards by NPCs. You can also buy certain rare cards by finding merchants around towns, similarly to how you could purchase relics from Chester in the original campaign. Finally, we had an opportunity to try out Shovel Knight’s newly-announced multiplayer mode, Showdown. On its own, Showdown is enough to be a game on its own. Four players battle to capture a set amount of gems each round, and while that’s enough for a short party game with mild replayability, Yacht Club decided instead to go all-out and offer a ruleset deep enough to keep us coming back for more. While Showdown isn’t on the same level as Smash Bros., it’s still quite adaptable and complex. If you’d rather battle for lives than gems, you can do that. Team Battle? It’s there, too. There are more game types in Showdown, but Yacht Club wasn’t yet ready to demo them for us. Each stage has a set number of gems you must collect to emerge victorious; if nobody gets them all, the player with the highest number of gems at the end of the match wins. 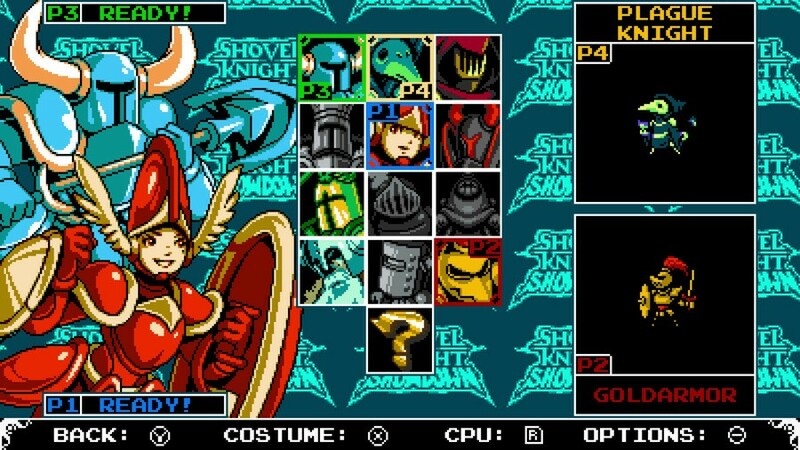 We thoroughly enjoyed playing Showdown, especially as some of the characters that fans of the series have never had a chance to use before, such as Shield Knight and Goldarmor. In the demo build not all of the 12-character roster was yet available, but that’s understandable as we’re still more than six months away from launch as of this writing. The penultimate chapter of Shovel Knight is nearly here, and as we prepare to bid farewell to our spectacular spadester and his cadre of comrades, both good and evil, we can’t help to feel incredulous that we’re still looking forward to playing a four-year-old game thanks to the tireless efforts of Yacht Club to make good on their promises. We have faith that when we do get our hands on the finished product next Spring, the final version of Shovel Knight will be even better than the already stellar game that has come before. ...except in the case of every other Switch game being released. Ba-dum-ching! @Morgan19 That made me chuckle, thank you. @Malcrash They also stated that King of Cards is the longest campaign by far, so that is why it must be taking so long! After putting more than 30 hours into the original Shovel Knight on Wii U I burned myself out on it half way through my 2nd play through. I tried to get into Plague Knight and Spectre Knight but it just wasn't happening. @OorWullie Those were all part of their Kickstarter campaign stretch goals and they wanted to follow through because they have integrity unlike a lot of other kickstarters. @Jokerwolf I understand that and can only admire them for keeping their word but I think it's safe to say most folk are ready to see something new from them. If they have only been working on this extra content for the last few years instead of doing it on the side while they create their next gem, that would be a real shame. We could be waiting until 2020 in that case. 8 years after the release of SK. I have such a back log of games that I haven't been able to revisit Shovel Knight. Might take a while before I get to this. But I love FREE. Anyone who doesn't have Treasure Trove I would highly recommend to get it. It has insane value for what is included. Shovel Knight still keeps me entertained. I've 100%ed the Shovel achievements but I'm still working on the two others from time to time. @OorWullie They could keep releasing sequels for years as far as I'm concerned, I'm fine with it ! The final game I play for my 3DS. Cannot wait. I adore this game and I adore Yacht Club Games. I would love to see them try their hand at paying tribute to the 16-32 bit era of gaming next. Looking forward to this new DLC; hoping we get a sequel one of these days as well. Delicious excitement resides in me. @OorWullie It is only good that they are doing these though, it is giving them a level of expertise in game design and development that they may otherwise not get creating a new project altogether. ok, no offense Yacht Club, I love ya, but maybe now you can focus on making an actual sequel to shovel knight? @ouroborous They learned the value of patience and benefits of taking our time. Shovel knight game is a pearl a sequel will happen for sure. I'm excited for this, but even more excited to see what Yacht Club will create now that they're able to move on from Shovel Knight. @OorWullie I get not liking the Plague Knight DLC (I think it’s fine, but the worst of all of the Shovel Knight content), but I honestly think Spectre Knight’s campaign is even better than the original game in some ways. And that’s saying a lot because Shovel Knight might be my favorite game ever. @imgrowinglegs The Spectre Knight content was awesome. I think I did enjoy it even more than the original Shovel Knight campaign, although it's been a few years since I played the original so it's tough to compare. Is the King of Cards thing free for the 3DS retail version? I seemed to get the last one free. I may pick up Shovel Knight on switch when king of cards releases. Even though I'd be perfectly happy to play it for free on my wii u version, and I don't normally double dip on any games, I feel like these guys deserve to be supported. Yacht Club, and also Team Cherry, put so many developers to shame with both the quality and value of their games. 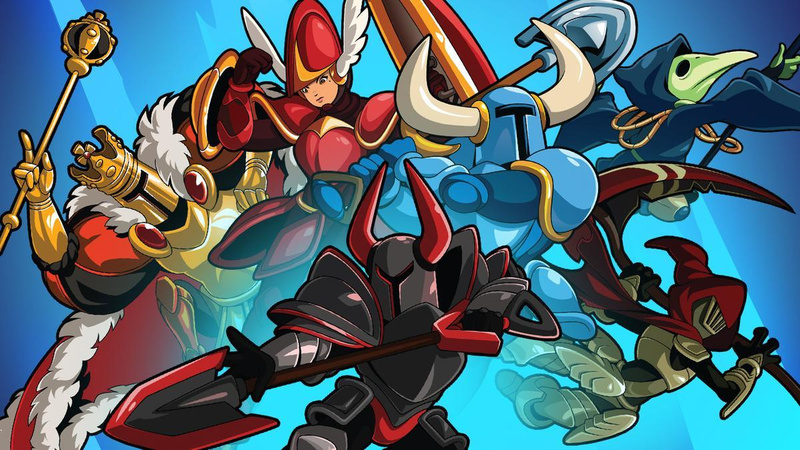 It is amazing what they have given to fans of Shovel Knight, if ever there is or was a title that kept giving to it's players it is Shovel Knight. Each campaign has been spectacular not to mention we will have amiibos of the lead character for each campaign when the last one gets released this coming April . I am looking forward to getting a new campaign with Shovel Knight as the lead character again it's time for him to get a new adventure and be in the spotlight again. @tedko, I agree with you, I have Shovel Knight on my Wii U, 3DS and Switch. The 3DS is my favorite edition as I love the stereoscopic 3D effect in the game it looks fantastic in 3D . I hope Shovel Knight Showdown will make it to esports. Will it have online play? This game really is one of the crowing gaming achievements of the last however many years. If Yacht Club Games continues to put this much love and attention into its future titles then I think it's on its way to becoming one of the greatest and most beloved game developers in the industry. Major Kudos for what the team has achieved so far, and I look forward to seeing whatever they do next. . . .
Penultimate means second to last, so is there another one coming after these, or are you referring to King of Cards as penultimate and Showdown the final dlc? @Kdaesung I had the exact same reaction! Pretty sure this is the final DLC, not the penultimate one. Also, Plague Knight rules, and I will fight anyone who says different. Or at least throw an 8-bit bomb at them. DLC or new games I just want more things from yacht club! The Specter Knight campaign is way easier, but the New Game + is more of a challenge I think. @Balta666 @Tibob It's funny, I don't recall thinking the Spectre Knight campaign was significantly easier. I just liked the feel of how he moves. I remember doing that vertical section where the order of the sections is randomized, and found that quite a challenge. It took me quite a few tries but it felt great when I beat it. I did also enjoy plague knight but it took me a while to get used to his move set. Honestly, they're all great! @OorWullie the good news for you is they did a survey some time back to see what people would like to see after Shovel Knight is complete. I don't know the results, but there were a number of options besides a Shovel Knight 2. As much as I think it would be great, I think a sequel should come later, especially since Shovel Knight is multiple games as it is. I think it needs time to be missed. At least we know they're thinking about it. For a game company that really only has one game under their belt, I have a surprising amount of confidence in whatever project Yacht Club chooses to do next. They've clearly got a fine tuned sense of level design and gameplay. And most importantly, some of the best puns I've had the pleasure of groaning at. Shovel Knight is easily one of my favorite games in years. More content is always a good thing, especially when it's free. I hope we get more great old school inspired games like these, Bloodstained was great and The Messenger is a lot of fun. @ouroborous I feel in many ways these ARE sequels, they just don't star shovel knight. 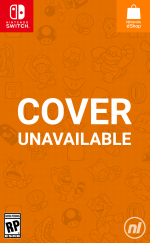 Each iteration has expanded the gameplay and universe which is normally what one expects from a sequel. They're SUCH good games (I see the expansions as new games, because ultimately they are) and I'm sad people are railing in YC about it. These things take time and effort. They'll move onto a new project once they finish up with their promises. I prefer their integrity over any studio who scrambles to cobble something together only to capitalize on a given trend. Pshh, that King Knight. You give him an inch, he thinks he's a ruler!